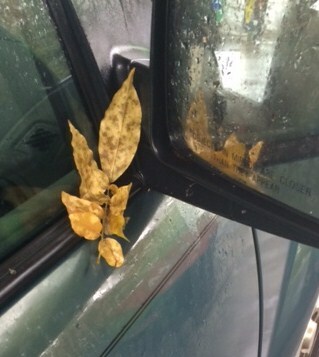 Like the leaf I found wedged between my windshield and car mirror (yesterday at the gas station) struggling to ‘hang on’, I, too, found myself in a similar situation last Wednesday in regard to the blog . Thank you for all your concerned emails…let me assure you that I am fine…..this was not a health issue…at least physically. I have missed talking with all of you…and will explain the “Wacky Woeful Wednesday” episode that necessitated some unexpected changes. The blog will be a work in progress…adding on as we go. A clean slate. Let me also assure you that God has held my hand through all of this sending angels to guide me…beside me. So, hopefully, until tomorrow…Take care and try to stay dry. Back at you sister Brookie…love you! Welcome back, my friend!!! I have missed you and know Chapel of Hope Part II will be even more of a blessing than Part I. Love you!!!! Thank you Anne…it feels good to be back in the saddle! Glad you are back! This should be quite a story tomorrow! Unfortunately it will be…but light at the end of the tunnel!